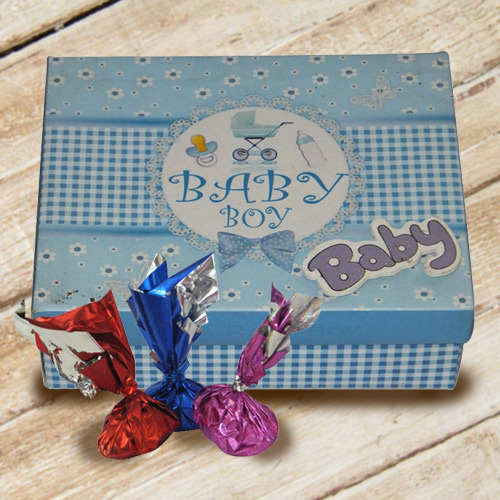 Send this Delightful Baby Boy Homemade Chocolate Box with Essence of Indulgence to your special one and make him/her smile. This Chocolate Box is filled with 15Pcs Assorted Chocolates and 5Pcs Lollypops. Flowers Delivery Ahmedabad, Send sweets Kolhapur, Wedding Cake Bharatpur, Diwali Mithai Goa, Send Flowers and Gifts to Gajraula, Online Shop Nagpur, Flower to Proddutur, New Year Flowers Saharanpur , Fresh Fruits Faridabad, Send Gift Madurai, Dry Fruits to Sikar, Birthday Delivery Goraya, Sending to Shencottah, Flower shop Sawai Madhopur, Purnia Online Cake Delivery.